Visiting the light, airy, friendly Pure Nest Café in Muswell Hill www.purenestcafe.com , it is very reassuring to know that everything on the menu is dairy free and gluten free. Ray & I couldn’t quite grasp this, so we had to keep double-checking just to make sure. What a treat to be able to choose absolutely anything from the menu that offers breakfast and lunch items, as well as desserts! As regular readers know, finding desserts that are dairy free and gluten free is a real challenge. Normally Ray & I never have desserts and it has been known for Ray to be given a banana at a restaurant while everyone else had a ‘proper’ dessert! So we couldn’t believe our luck. The menu also asks for anyone with special dietary requirements to inform a member of staff before placing the order. 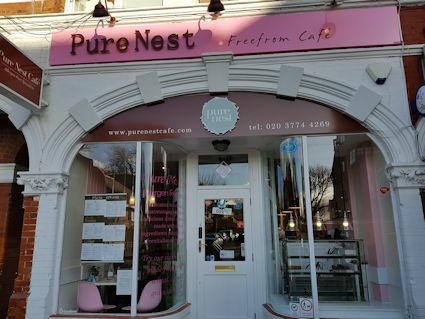 Pure Nest Café is Muswell Hill’s first ‘free from’ café. Owner Josie Peterson, a naturopathic nutritional therapist, opened the café 18 months ago with her business partner Mohamed Yousef. 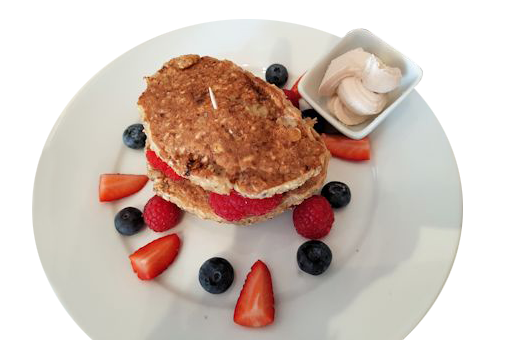 The inspiration for the café comes from Josie who has food allergies herself (she is dairy free and wheat intolerant) so she knows only too well the difficulties we face when dining out. Pure Nest Café has an impressive drinks menu offering all manner of hot drinks, bottled juices and smoothies. This includes naturally caffeine free coffee alternatives and “Cold Brew”. This is a 16th century Japanese method, brewing the coffee for 24 hours “which reduces the coffee tummy burn by 69%,” she adds. A house speciality is Josie’s Signature Hot Chocolate (regular £3.75; large £5.57) Once I tasted it, I could see why. 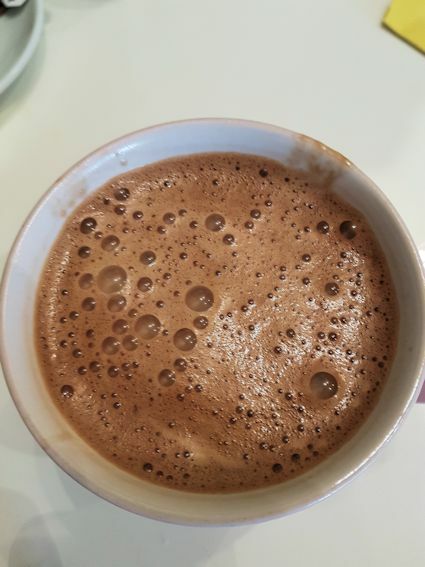 This is a rich, creamy hot chocolate blended with coconut milk, coconut oil, cayenne pepper (for blood circulation) and cinnamon (for regulating blood sugar levels). It is delicious and well recommended! The café is popular with families with young children and is well equipped with special chairs, a play area as well as a kiddies menu. 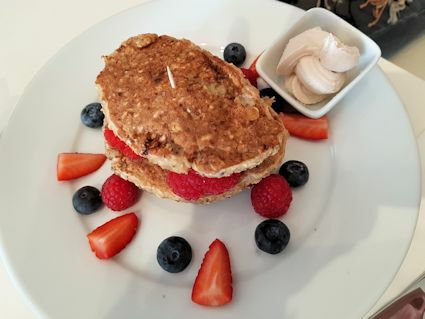 A customer on the next table ordered the Fluffy Banana Oat Pancakes (£7.50) (vegan and gluten free) with fresh fruit, maple syrup and coconut cream. It looked scrumptious and apparently tasted great too. Must have that next time! 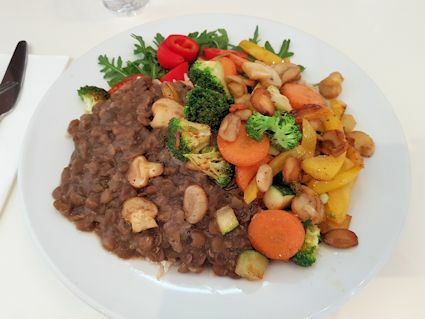 Her companion enjoyed the Vegan Buddha Bowel (bowl £3.50; plate £7.50) a black bean stew with wholegrain basmati rice and sautéed vegetables. It looked yummy! And what did we have? 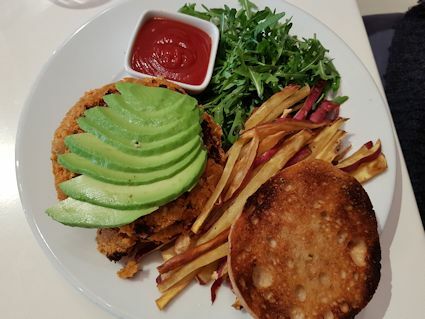 Ray opted for the Spicy Chickpea and Avocado Vegan Burger (£8.50) in a gluten free bun, served with sweet potato chips and a side salad. The burger was moist, crumbly and flavoursome; the bun was crisp unlike most gluten free bread, while the sweet potato fries were finely cut, not chunky, and delicious. Gluten free pasta is always problematic – it can taste brittle if undercooked, so when you order it in a restaurant, you’re never too sure how it’s going to turn out. 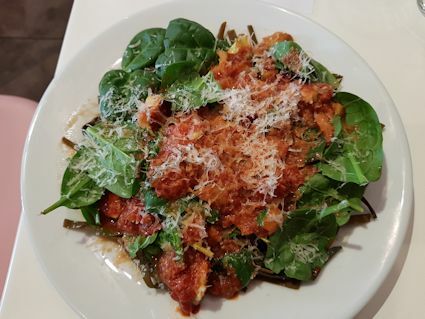 Pure Nest Café offers three types gluten free pasta in its vegan Vegetable Pasta (£7.50) dish – buckwheat spirals, chickpea fusilli and seaweed Tagliatelle. I chose the seaweed Tagliatelle as I’d never tried it before. The sauce was made with courgettes, mushrooms, carrots, red pepper, spring onion, garlic, broccoli in a tomato sauce finished off with vegan cheese. The seawood Tagliatelle was crunchy, with a great texture, while the sauce is delicious with a bit of a kick to it, but not too spicy. The vegan cheese was finely grated and tasted great, unlike other vegan cheese I’ve tried in the past which had a synthetic taste. The dishes were filling, but we were determined to try the desserts. We sampled a selection of Josie’s cakes. It was a real treat to be able to eat the same desserts – normally Ray & I have to order different desserts or nothing at all! 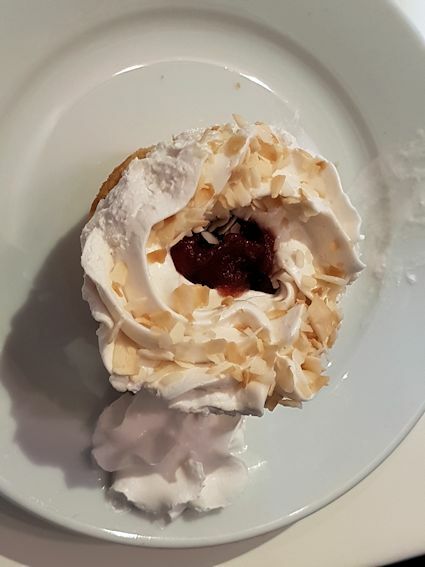 My favourite was Roasted Cream of Coconut cupcake (£2.95), a moist light cake with coconut and jam, but they were all good. The dairy free whipped cream was impressive - other similar creams I've tasted have been very watery and bland, but not this one! Other varieties included Velvety Vanilla Cupcake (£2.95) and Chocoholics Cream Brownie (£2.95). Josie also makes celebration cakes for special occasions. Another house speciality is the Chocoholics Dream Brownie Pot (£5) – chocolate brownie crumble layered with chocolate ganache and caramel and topped with coconut whipped cream. This is truly scrumptious! 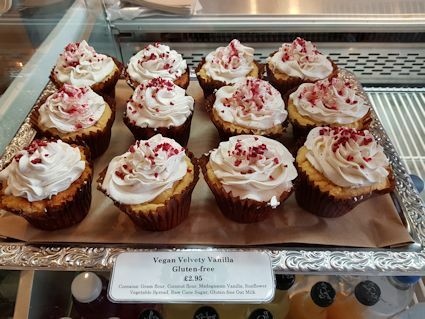 Josie is about to launch her own range of gluten free and vegan cake mixes - £10 for a mix for 12 cupcakes. What a good idea. She also offers an outside catering service and provides canapes for local events. Josie has been working with Food Allergy Aware www.fatc.co.uk a leading national supplier of free from training, auditing and consultancy. A great experience and we will return.